Conformal coating can be broadly classified as either plastic or resin material that is applied to electronic devices to provide protection from various forms of environmental contamination. The coating must be removed—either entirely or in specific areas—when a component fails, to expose a test point, or for reverse engineering. 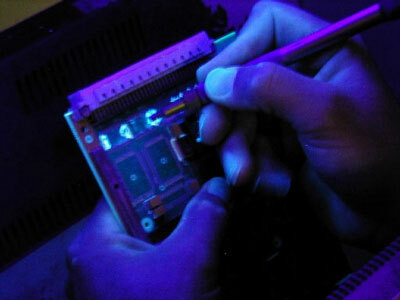 MicroBlasting is often used to selectively remove conformal coating. It is precision sandblasting on a micro-scale. Unlike traditional sandblasting, MicroBlasting uses a very fine abrasive media mixed with compressed dry air. This mixture propels through a miniature nozzle designed to increase the stream’s velocity and give it a laser-beam focus. Depending on the abrasive in use and the composition of the targeted part, a micro-abrasive stream can texture, deburr, clean or erode microns of material. 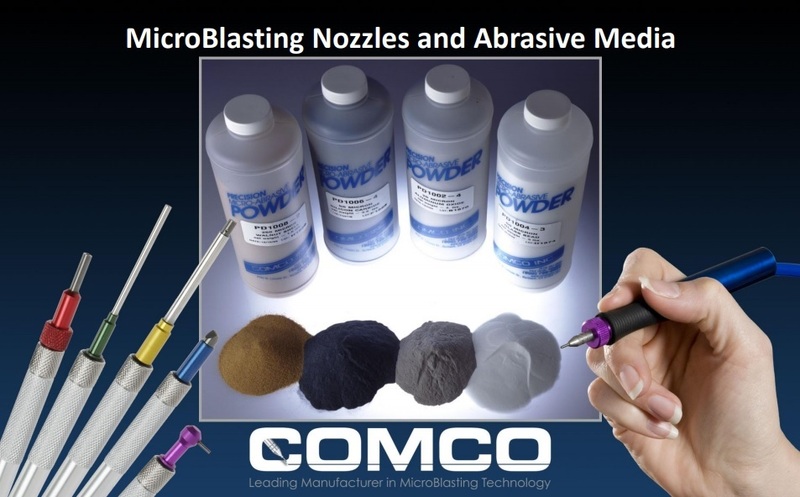 Comco MicroBlasting systems are used across industries to refine and alter the surfaces on small, delicate, and high-value parts. 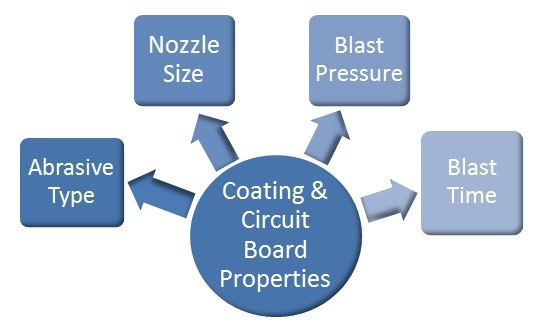 Conformal coatings can be removed using mechanical, thermal, or chemical processes, but each of these methods presents a unique risk. This method involves scraping, cutting, or grinding the coatings using anything from a small sharp knife to a handheld grinder. A slight slip can cause significant damage to the board, so this method requires highly-trained personnel. 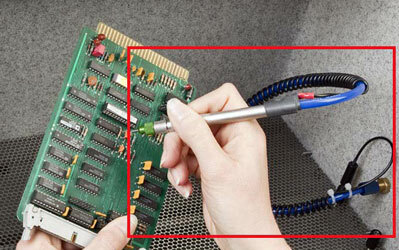 Thermal removal involves the use of a hot soldering iron to burn away the conformal coating. This method is quick if done correctly; however, burning is difficult to time, and hitting a target precisely is not easy. What’s more, certain types of coatings generate hazardous, toxic fumes while hot. Chemical stripping effectively removes many conformal coatings, but these chemicals can easily leach beneath coating and damage the board. Chemical storage and disposal add safety and environmental restrictions. Finally, chemical stripping is the most time-consuming of all the removal methods. 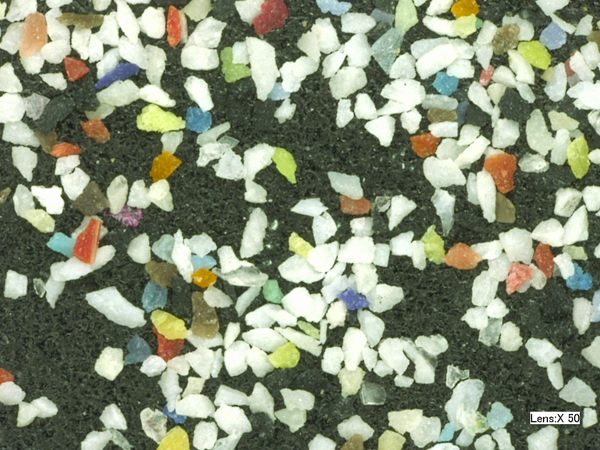 MicroBlasting is inherently precise and controllable. The micro-scale of the technology is ideal for selectively targeting surface areas on small, intricate and delicate parts. 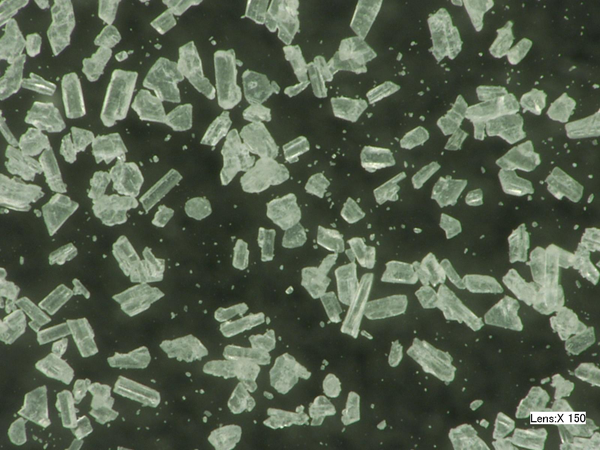 MicroBlasting uses very fine abrasives (17.5-350 µ) and very small nozzles (0.018-0.125″). Together, these tools provide the pinpoint precision needed to remove coating around delicate components or remove individual layers from a circuit board. The patented modulated abrasive feed in Comco MicroBlasting systems further enhances the precision of this method. Our feed delivers a consistent mixture of air and abrasive, guaranteeing repeatable results. Coating properties drive your blasting process. These properties include more than material composition: coating thickness and location on the board are critical to removal, too. Abrasive selection, nozzle selection, blast time and blast pressure are determined by the coating properties. These variables are dialed in during a sample test or by a process engineer. Once the blasting recipe is set, keeping results constant board-to-board is relatively easy. The most important variable in your blasting process is abrasive selection. 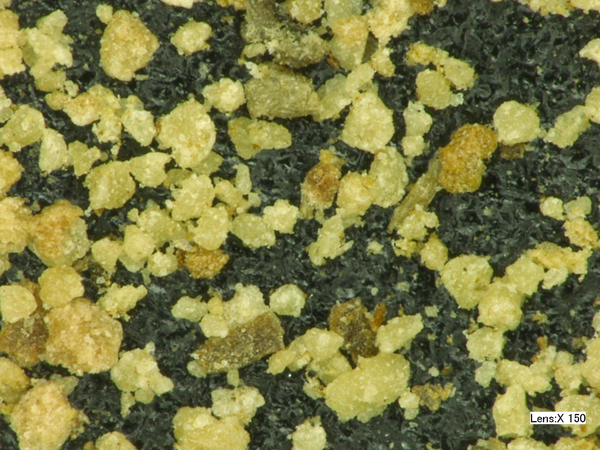 The size, shape, and hardness of an individual abrasive particle give each media unique characteristics; therefore, every coating must be matched with the right abrasive. An abrasive with a blocky-shaped particle may quickly and easily remove one type of coating but smear another type. 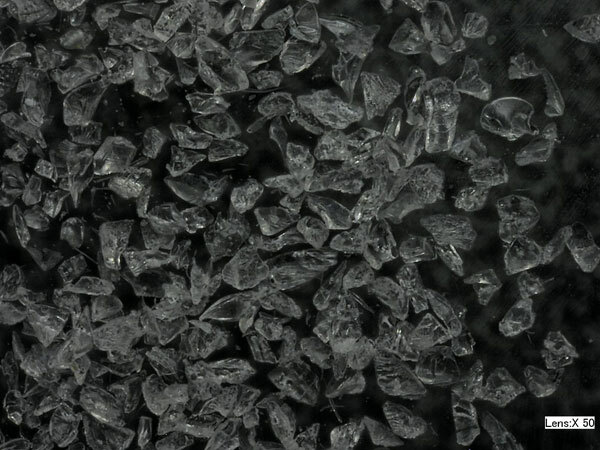 One coating may respond well to a sharper particle, while another coating may be too thin for an aggressive media. A good rule of thumb is to start sample testing with one of the softest abrasives, like wheat starch, and work up. If a coating is really thick, MicroBlasting could just smear it. In these applications, we recommend using a two-step process. Remove the top layers or the bulk of the material with a mechanical option. Then, use MicroBlasting to gently remove the layers closer to the board. Here is a reference chart to guide your abrasive selection. Wheat starch is the softest abrasive available for conformal coating removal applications. It has soft particles with shard-like edges, which make it excellent for abrading thin, pliable coatings like parylene and acrylic. It is so soft that it presents a limited risk to the solder mask and underlying components on a circuit board. We often start with wheat starch in sample tests, because it removes more carefully and precisely than the rest. Plastic media is a gentle abrasive and works well against the broadest range of coatings. It is the utility player of conformal coating removal abrasives. It quickly removes parylene and thick coatings. It is slightly harder than wheat starch, and its particles are smaller than walnut shell. Plastic media is treated to reduce electrostatic discharge. If plastic media is not aggressive enough, try walnut shell. This is still one of our soft abrasives, so it is forgiving of operator error. But it features a slightly larger particle size with slightly sharper edges, which gives it greater cutting power. While sodium bicarbonate is a soft abrasive, it is the most aggressive option for conformal coating removal. Its particles have a needle‐like shape, which makes it an excellent abrading tool against pliable materials. Sodium bicarbonate is recommended for hard, stubborn coatings. Sodium bicarbonate, wheat starch, and walnut shell are biodegradable. Sodium bicarbonate and wheat starch are water soluble, which makes for easy clean-up. 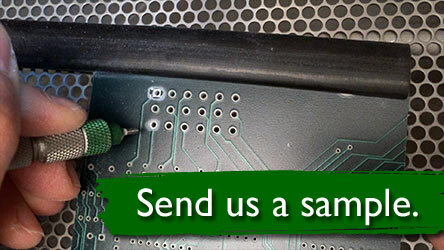 Conductive nozzles are recommended for conformal coating removal applications. A conductive nozzle eliminates any charge that could build in the abrasive hose. Conductive nozzles are part of our Hi/Performance line. The diameter size of the nozzle opening should be a minimum of 4x the average particle size of the abrasive in use. This rule prevents clogging in the nozzle and ensures a smooth, consistent flow. A small, round opening produces a highly focused stream of abrasive, which gives the operator the most precise control. The larger the nozzle opening, the greater the coverage on the board surface. Most conductive nozzles feature a round opening and range in size from 0.018″ to 0.060″. 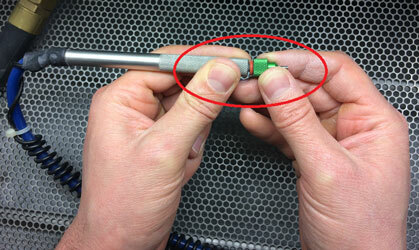 Successful conformal coating removal requires the right nozzle angle. 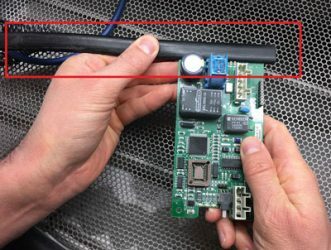 Nozzle angle is dependent on the amount of material that needs to be removed and where that material is located on the board. Commonly, these applications only require the removal of a small fraction of material for testing. The operator should hold the nozzle at a slight angle and approximately 1/4″ from the surface of the board for maximum control. If a large section of the coating must be removed, we recommend targeting the section from two angles to speed up the removal process. Start by blasting from a shallow angle to get the abrasive stream under the surface layer of coating. Essentially “peel” up the coating with the blast stream. 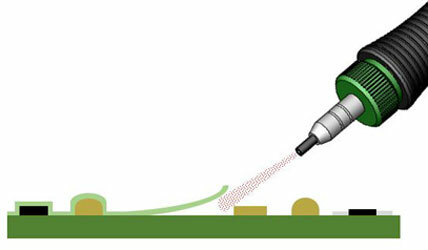 Nozzle angle, nozzle distance, and blast pressure influence the force of the abrasive stream. Our Applications Lab sets these parameters along with the blasting variables mentioned above during the sample test process. If you plan to dial in the process on your own, check out the two blog posts below for further instruction. Conformal coatings were originally developed to help parts meet stringent military specifications. The same strict requirements applied to coating removal. Because it is precise and controllable, MicroBlasting became the preferred removal method for many military facilities and their contractors. These applications often involved devices that could be damaged by exposure to electrostatic discharge or ‘ESD’. Micro-abrasive blasting systems do generate some static electricity. If this charge is not dissipated, an ESD event (an electric spark) can occur. To protect against such events, our engineers designed and developed custom workstations for our military customers. The success of conformal coatings brought them into mainstream industrial use during the 1970s. We then used the research behind our custom workstations to develop solutions that could work with a wider range of applications. Over the last four decades, our workstations evolved along with the advancements in manufacturing. 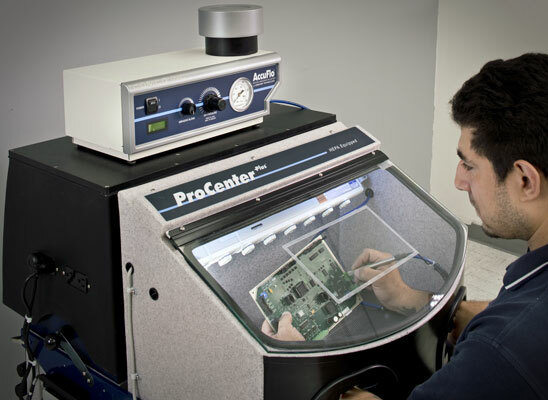 Any components that are sensitive to electrostatic should be processed in the ProCenter Plus™ with ESD Control. This unit delivers maximum protection against an ESD event. 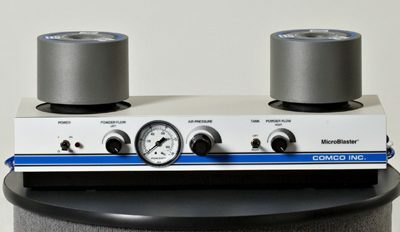 What is the ProCenter Plus? The ProCenter Plus is everything necessary to a MicroBlasting system except the blaster. It is a compact, chair-height workstation with an integrated dust collection system and an attached air dryer. It confines the blast area while a built‐in HEPA‐equipped dust collector extracts spent abrasive. It is easy to use and easy to maintain. The ProCenter Plus partners best with the AccuFlo® to form a complete manual MicroBlasting system. The ProCenter Plus with ESD control has additional features that collaboratively neutralize surface charges and reduce electrostatic build-up. Floods the entire work chamber with ionized air to neutralize static build-up. Built-in sensors monitor the effectiveness of the ion flow and indicator lights alert the operator to any changes in operation. 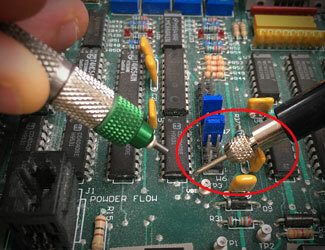 Works with the conductive nozzle to provide a conduit for static, sending it straight to the grounding jacks instead of onto a PCB. Limits the potential for a charge to travel to the board from the abrasive hose. A conductive nozzle also blocks a charge that could arc from the operator. Should be used with the grounded handpiece. 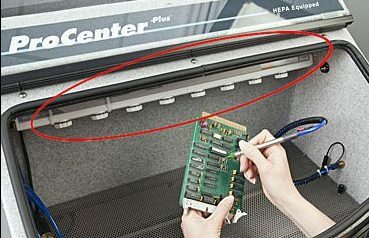 Provide convenient connection points for a wrist-stat, the edge grounding bar, and the needle probe. Grounds all edge pins on boards that have edge connectors. 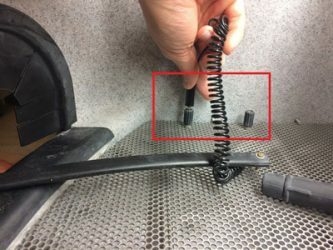 This bar is made of conductive rubber material and connects to a grounding jack on the floor of the ProCenter Plus. 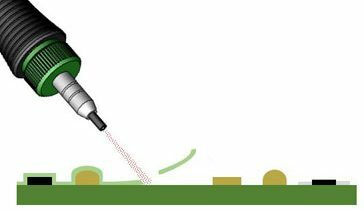 Pierces through the coating and grounds a target trace when the defect is known to be an open trace with no conductive path to ground. Installed for coatings that are more easily visible under ultra-violet lighting. Window: Tempered glass opening (hinged) 23" x 11"
Quickly alternate between two different types of abrasive media with the flick of a switch. Applications where coatings vary from piece-to-piece benefit most from the Dual Tank MicroBlaster. See small details more easily and reduce eye strain with the magnifier. Provides 2.5x magnification and an 8‐10″ depth of focus and allows an operator to sit at a natural, comfortable distance. Preserve your investment. 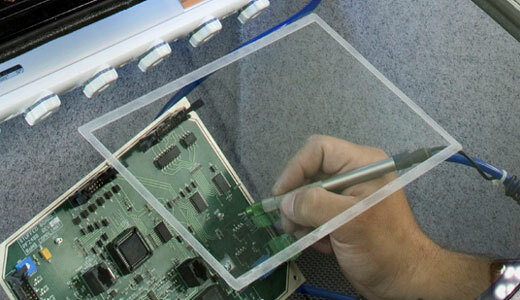 Window shields protect workstation glass against abrasive ricochet. 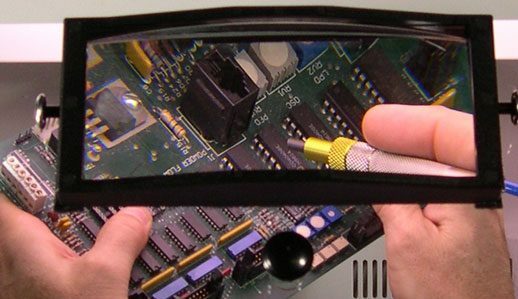 Easy to attach and remove, VisionPlus window shields are available in packs of 3 or 10. Many factors contribute to the removal process, but the best way to find out if MicroBlasting is the ideal solution for your challenge is to test a sample part. Our Applications Engineers have the tools on-hand to test different variables, and they have the experience to know where to begin. All test procedures and results are documented in a full lab report returned to you alongside the tested sample parts for evaluation. Check out our blog entry “We Take Samples Seriously” to learn more about the testing process, and contact a Comco Sales Team member to schedule a sample part test.